Alain Kaloyeros, the former president of SUNY Polytechnic Institute who spearheaded key pieces of Governor Andrew Cuomo’s vaunted Buffalo Billion economic revitalization program, was found guilty in federal court on Thursday of bid-rigging state contracts in favor of upstate firms whose executives were major donors to the governor’s campaign. 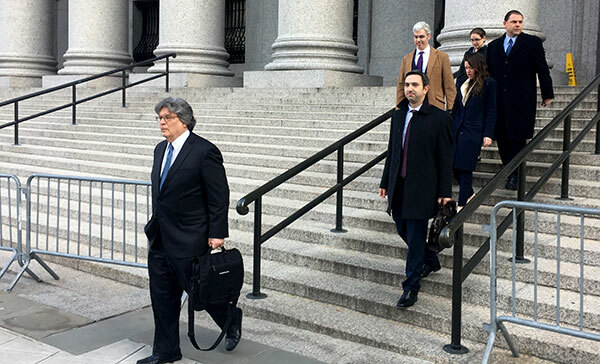 Following a trial that lasted just under a month, a jury found Kaloyeros guilty on charges of wire fraud and conspiracy to commit wire fraud in connection with two separate schemes in which he colluded with a prominent lobbyist to manipulate state contract bids. Prosecutors charged Kaloyeros with rigging requests for proposals (RFPs) to favor prominent executives from two specific firms -- Louis Ciminelli from Buffalo-based LPCiminelli, and Joseph Gerardi and Steven Aiello from Syracuse-based COR Development. Ciminelli, Gerardi and Aiello also stood trial with Kaloyeros and were found guilty on Thursday as well. The defendants are all expected to be sentenced in October. Kaloyeros, who the governor praised in lofty terms when appointing him to lead the Buffalo Billion and over the course of subsequent years, conspired on the two schemes with the developers and Todd Howe, a now infamous lobbyist with close ties to Cuomo. Howe was the government’s star witness in another federal corruption case earlier this year involving former top Cuomo aide Joe Percoco, who was also convicted. COR executives Gerardi and Aiello were co-defendants in that trial as well. Prosecutors in the Kaloyeros trial relied on email records that showed the eccentric tech guru plotted to ensure that LPCiminelli received a contract to construct a solar panel factory, which eventually ballooned in cost to $750 million, and that COR development was awarded more than $100 million to build a manufacturing plant and film studio. The bid-rigging was done in apparent effort to please Cuomo, though the governor himself was not accused of committing any crimes. In a statement, Geoffrey Berman, the U.S. Attorney for the Southern District of New York, whose office prosecuted the case, expressed pride that the Kaloyeros verdict was just the latest successful conviction won by the office’s Public Corruption Unit, following the conviction of Percoco and former state Assembly Speaker Sheldon Silver. “The guiding principle of the Southern District holds that true justice can only be achieved through independence from politics or influence, and that has never been more important than today,” he said. Cuomo, who has said that he has not followed the case closely, said in his own statement, “The jury has spoken and justice has been done. There can be no tolerance for those who seek to defraud the system to advance their own personal interests. Anyone who has committed such an egregious act should be punished to the full extent of the law." Cuomo did not mention anyone by name or promise any reforms. He has not followed through on several governmental and campaign promises he made when the scandal broke. “The single best ethics reform, which makes everything else moot, is no outside income in government,” he said, pointing to the State Legislature. Jobs there are considered part-time and outside income is allowed, though the Percoco trial had nothing to do with legislators’ outside income. Cuomo called Percoco’s behavior an “aberration” for those in his administration, and said he himself was not mentioned at the trial; in fact, Cuomo’s name or title was invoked hundreds of times. The governor has sought to quickly put the Percoco news behind him, though there are a number of unanswered questions about what Cuomo either allowed to occur under his watch, didn’t know about, or empowered Percoco to do. Just on the horizon, too, is the trial of Alain Kaloyeros, scheduled to start June 18, proceedings sure to raise further questions about the governor’s leadership and deepen the stain on the Cuomo administration. Valerie Caproni, the same judge who presided over the Percoco trial, will oversee the Kaloyeros case. Kaloyeros, the eccentric scientist whom Cuomo empowered to lead key parts of his Buffalo Billion revitalization initiative, is accused of bid-rigging to help developers who donated to the Cuomo campaign. Expect the trial -- which also includes alleged Kaloyeros co-conspirators -- to reveal even more damning details about how members of Cuomo’s inner circle doled out hundreds of millions of dollars through Buffalo Billion. 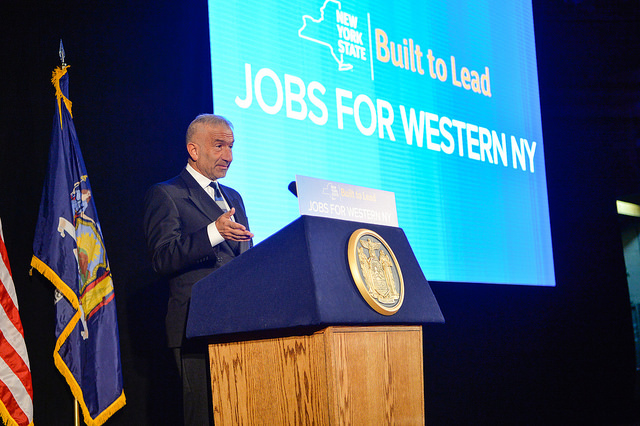 Cuomo announced the initiative in 2012 in hopes of revitalizing the western New York city’s struggling economy. 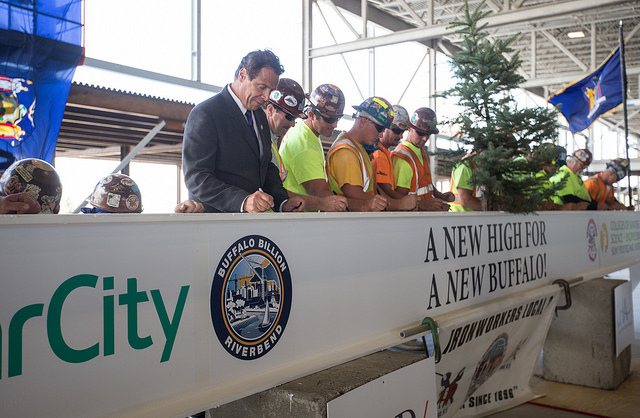 Though the biggest Buffalo Billion project, a solar panel factory called SolarCity, is at the center of the Kaloyeros trial, Cuomo recently launched a sequel called Buffalo Billion II that will focus on small- and medium-sized manufacturers. The Kaloyeros trial could shed more light on an alleged pay-to-play culture in which developers were rewarded after donating to the governor, a key aspect of the Percoco trial. Further, for all the attention Kaloyeros received during his years as a flamboyant tech-industry pioneer, there’s the question of why he allegedly helped rig bids to ensure major campaign contributors won state contracts – without being accused of taking bribes himself. The trial might provide answers about that, too. For his part, Kaloyeros was never modest about his work. “He had his own aspirations as an empire-builder and his own vision of these gigantic multibillion-dollar chip factories that were going to spur a manufacturing renaissance,” Kaehny explained. Kaloyeros allegedly collaborated with Albany insider Todd Howe, who made a plea deal in the Kaloyeros and Percoco cases, to rig bidding for hundreds of millions of dollars’ worth of state contracts. 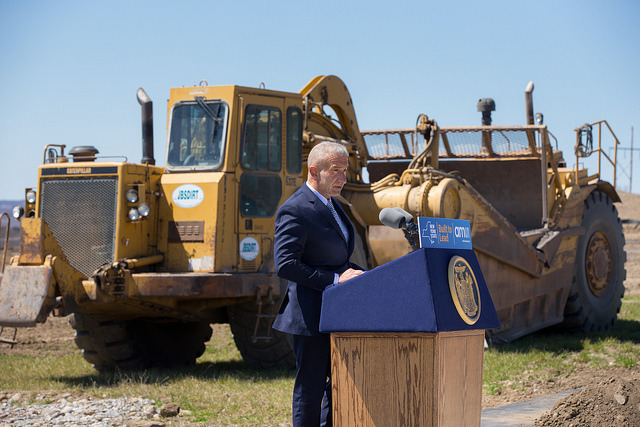 The indictment from the U.S Attorney for the Southern District of New York describes a scheme in which two companies – COR Development and LP Ciminelli – paid thousands of dollars in bribes to Howe. In exchange, he and Kaloyeros allegedly ensured that the developers won a range of lucrative contracts – a $15 million film studio and a $90 million manufacturing plant for COR Development; and a $225 million solar panel plant for LPCiminelli, with the cost eventually rising to $750 million, according to the indictment. All of it came from taxpayer dollars allocated toward Cuomo’s signature economic development programs. 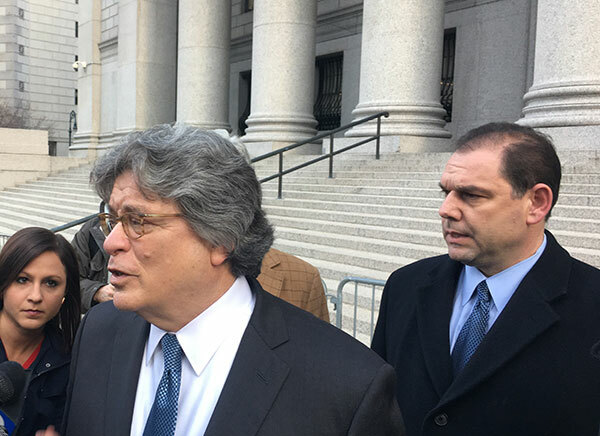 Last week, COR Development’s President Steven Aiello was found guilty of his role in the Percoco case, while the company’s general counsel Joseph Gerardi was found not guilty. LP Ciminelli executives did not face charges in that trial. The dollar figures in the Kaloyeros trial are much larger than those in the Percoco matter. The program at play, Buffalo Billion, is inextricable from Cuomo’s record as governor, unlike anything involved in the Percoco trial – except Peroco himself and the state’s porous campaign finance system. The indictment notes that Kaloyeros hired Howe as a consultant at the College of Nanoscale Science and Engineering (CNSE), which later became SUNY Polytechnic, as the college was crafting requests for proposals for the development projects in 2013. COR Development and LP Ciminelli allegedly made its bribes to Howe, disguised as consultancy payments and bonuses, around the same time. 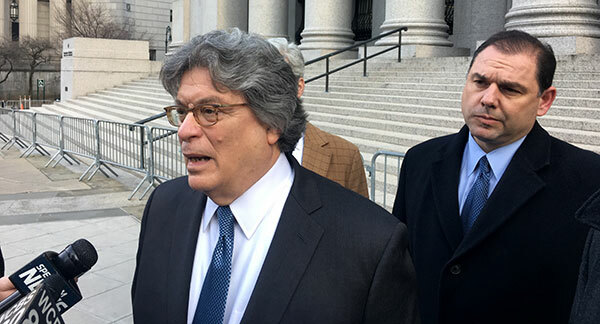 The nature of the relationship between the scientist and the former lobbyist, a longtime Cuomo ally and operator in the upper echelons of state government in spite of a 2010 bank fraud conviction, could come into sharper focus during the upcoming trial. Blair Horner, executive director of NYPIRG, another good government group, speculated that Kaloyeros’ role in the alleged scheme could come down to love of his work. “He was the highest paid staff person in the state, probably in the history of the state,” Horner said, referring to Kaloyeros’ combined annual salary of more than $800,000. “It wouldn’t surprise me if it turned out he loved what he was doing and did not want to lose it,” he added, emphasizing that the charges remain to be proven. Thus far into the corruption scandal, both prosecutors and journalists have mostly focused on the alleged bribery, the players involved, and their ties to Cuomo. But the investigation also raises questions about apparent favoritism for developers who gave big to Cuomo’s campaign accounts. The indictment does not detail the contributions, and none of the federal charges against Kaloyeros or the other defendants appear to directly stem from campaign finance law. However, the investigations prompted Cuomo’s reelection campaign to “set aside” a total of roughly $350,000 in contributions from COR Development and LP Ciminelli. Last fall, a Democratic official told lohud.com the move would enable authorities to recover the funds, pending the outcome of the trials. “The [Percoco] trial spotlights state laws that are so weak that what’s unethical is legal,” he added. New York State has no “doing business” restrictions on campaign donations. In New York City, entities on the “doing business” list are limited to about $400 in donations to an individual candidate. Government watchdogs, and a few elected officials, hope the trials will give renewed momentum to long-stalled proposals for a range of reforms. “I think the most important questions are ones not only about how the state can prevent future wrongdoing, but also what investments make sense for the state going forward, which may or may not come out” of the trials, said David Friedfel, director of state studies for the Citizens Budget Commission. Corruption or not, there have been ongoing questions about the Cuomo approach to economic development spending. 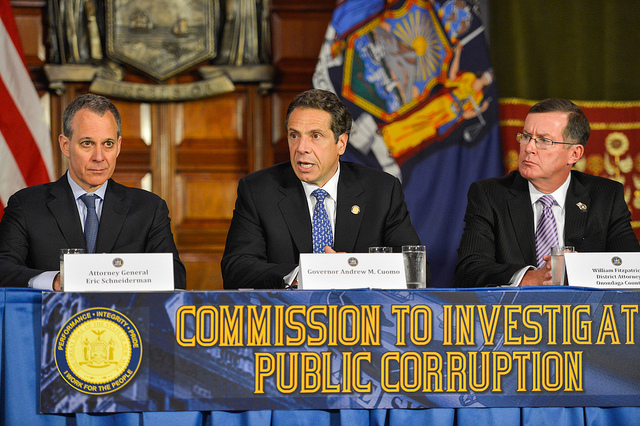 Reinvent Albany, NYPIRG, and other watchdogs have long called for tighter controls on campaign contributions, including closing the so-called LLC loophole, which featured prominently during the Percoco trial. It emerged that developers were encouraged to donate heavily to Cuomo, through several limited liability corporations that would help mask the contributors. Good government groups also emphasize the need for greater transparency for state spending, through measures like restoring the state comptroller’s power to pre-approve contracts. Cuomo and legislative leaders took away that power in 2011. Additionally, watchdogs hope the trials will boost support of a proposed “Database of Deals” that would list all state projects awarded to companies and detail the return on investment to taxpayers. Robin Schimminger introduced the Assembly bill to create the database. Asked about Percoco’s recent conviction and the upcoming Kaloyeros trial, the Buffalo-area Democrat took a wide view. “The most important thing is that when people serve in government, they have a moral compass,” he said. “If people don’t have that compass, they’re going to go astray. While Cuomo has a long list of ethics reforms again in his platform this year, including closure of the LLC loophole, he has not been outspoken in pushing for them. 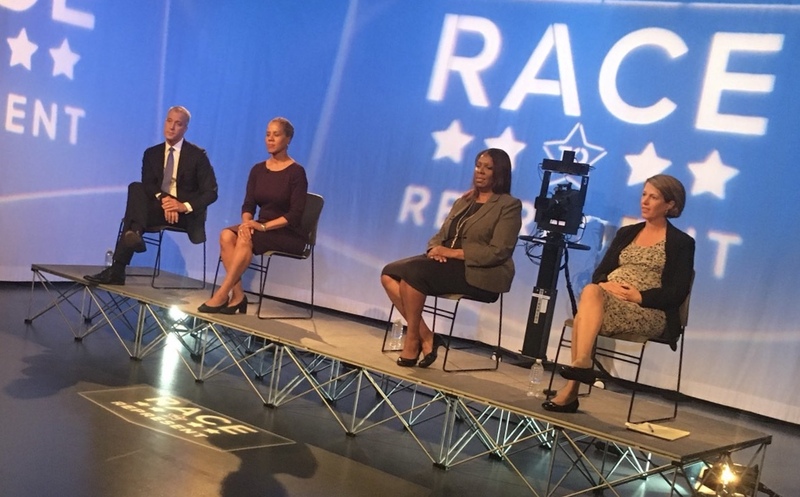 The governor’s campaign finances will again be on the stand, so to speak, during the Kaloyeros trial, which will begin as election season is heating up, with spring party nominating conventions. Cynthia Nixon’s dramatic entrance into the gubernatorial race, challenging Cuomo in this year’s Democratic primary, included a focus on corruption. She named Percoco from the podium at her launch event in Brooklyn on Tuesday, leveling a variety of blistering criticism at the governor. Nixon is likely to have ample opportunity to connect Cuomo to the trial, as will other gubernatorial candidates, like expected Republican nominee Marc Molinaro, currently Dutchess County Executive. Whatever the long-term consequences of the Kaloyeros trial, observers expect it to go more smoothly than the Percoco case, in which jurors were deadlocked twice before reaching guilty verdicts on some of the counts. Note: this article has been updated to reflet the Kaloyeros trial being moved back one week, to a June 18 start. The New York State legislature is often cited as the most corrupt in the nation and Bruce Roter, founder and president of the board of trustees of Albany’s upcoming Museum of Political Corruption, wants to tell the story of how we got there and help the state change course. A music professor by trade, Roter made a name for himself in the Albany area in 2012, when he led a successful grassroots campaign to bring Trader Joe’s to the capital region. Roter has since turned his energy to a somewhat more ambitious endeavor: tackling New York state government’s reputed “culture of corruption” by building an interactive, state-of-the-art, national attraction in downtown Albany. “We want to make sure we do this right. We want this museum to be a source of pride for our downtown,” said Roter (pictured), who has been plotting, planning, and building support for the not-for-profit museum for a few years. While the tentative open date for the brick-and-mortar location is in 2019, the museum team has kept the project in the limelight by hosting panel discussions and attending various events around town. On May 5, Nelly Bly’s birthday, the group will present its second annual Nelly Bly Award for investigative reporting, and a virtual exhibit may become available on the website soon. Susanne Craig of The New York Times was given the first Nelly Bly award in November 2017 at an event in downtown Albany. The Q-and-A below is lightly edited for clarity. Gotham Gazette (GG): We seem to be in an important moment in New York corruption history. The fate of Governor Cuomo’s former top aide Joe Percoco is being decided, two former legislative leaders will be retried this spring, among others. Have you been keeping up with the headlines? Bruce Roter (BR): “I do try to follow when I can. It’s all very concerning, of course. On the one hand, it’s concerning, and on the other hand, I just remember that this is just one more stage in corruption that our state has had, and that’s the long-term view that we are taking. “There are those who think that this is probably the most corrupt time that New York has ever had. That’s not the truth at all. One can look at other eras, the 1800s, the 1900s, the Tammany Hall period, and other periods like that. GG: What’s the latest on the Museum of Corruption? GG: What birthed the idea to create a museum of corruption? GG: You are a music professor at the College of Saint Rose. Have you ever worked for government before, or is your interest in ethical governance a byproduct of growing up in Albany? BR: “I actually grew up downstate and I’ve been here 20 years now. I’ve always had an interest in government and public affairs even in my own creative work as a composer. I’ve often been inspired by public causes. I’m the composer of a piece called the Camp David Overture for the Middle East Peace Accords. “Several years ago, I was commissioned to write a piece for the Albany Symphony on speeches and writings of [President and New York State Governor] Theodore Roosevelt, and I became very inspired by him, especially Roosevelt’s call for the public to engage in the civil discourse of their community. So that’s what I’m seeking to do also. GG: What’s the long game? Have you selected partners to run the museum while you are at your day job once you have a brick-and-mortar location? GG: How will you keep up with the endless stream of headlines and corruption trials and incorporate them into the museum’s exhibits? BR: “We will keep up. We want the museum to be current. 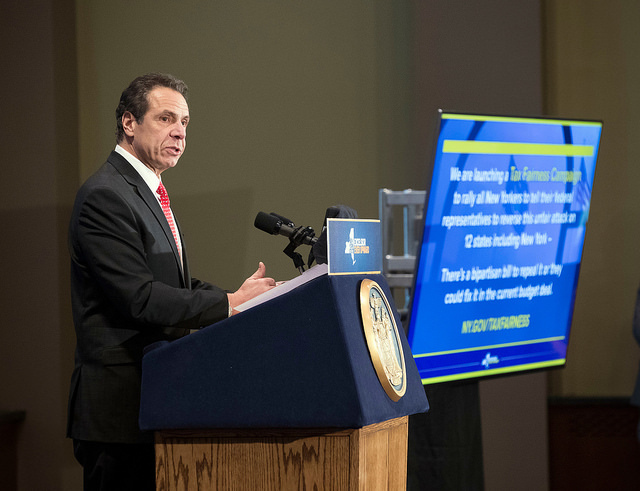 There will be rotating or evolving exhibits that will address what is going on currently, even as we also take the broader, historic view of corruption that has gone on for centuries in New York, as well as understanding the causes of corruption, and what we can do about corruption. GG: Have any lawmakers have reached out in support of this idea or taken an interest in this project? BR: “I can tell you that [Republican] Minority Assembly Leader Brian Kolb has been interested in our project -- along with some others. We are completely non-partisan and we want to make sure that we reach across the aisle and we want to bring all of our leaders onboard. Because this is not about a particular leader, this is about fixing our government and the public working with our leaders to create a better, more effective government. “I can tell you that one of the initiatives in which we are currently engaged is a collection of quotes on ethical leadership. We’re seeking quotes from leaders in a number of different fields, including politics and sports and religion and education. We do want to collect these quotes and perhaps even put them into a volume some day. We already received a quote -- a handwritten quote at that -- from former President Jimmy Carter, we’ve received a quote from Attorney General Eric Schneiderman, and one from Congressman Paul Tonko -- here in the Capital District -- and from Assemblymember Pat Fahy, and also Senator Ron Wyden of Oregon. GG: Corruption is certainly not limited to government. Do you hope that the ideas that come out of this will produce solutions that transcend government and apply to other institutions? GG: So is the objective to educate the public about corruption or to solicit feedback and crowdsource some solutions to the problem? BR: “It’s both. Ultimately we want to educate and inform, but we also want to empower as well....For those people who are cynical and think nothing can ever be done and nothing can ever change, we hope that by the time they leave our exhibits, they too feel that they can make a difference in our society. “We look at all of these headlines, and trials, and retrials, and with tremendous respect to everything that’s is going on with our legislature and our prosecutors, we also think the public needs to get involved too. Of course, the best way and the first way we get involved is at the ballot booth. That’s why we feel education is import part of any change. GG: Having moved to Albany last year to cover the Capitol, one thing I was struck by is how dramatic state government is, from the castle-like building, to the theatrics that happen daily on the Senate floor. As someone with a music background, do you plan to incorporate art, music, and performance into the museum’s exhibits? BR: “Of course! The whole discussion of public corruption can be held on so many levels. We’re going to have a Tammany Lecture hall in the museum where we can do panel discussions and public speaking, but can also do film theories or musical productions that address the subject as well. Art frequently has important things to say about what is going on in society. And so, I certainly want to encourage that. GG: Circling back to the current trials. Any new additions inspired by the trial of former Cuomo top aide Joe Percoco? In federal district court in lower Manhattan on Thursday morning, the prosecution offered its rebuttal to the defense’s closing arguments from the previous two days, capping a six-week long trial that has exposed the inner workings of the state government and put on display the actions and behavior of Percoco, whom Cuomo once referred to as “my father's third son.” The trial has raised questions about what Cuomo knew about Percoco’s activities, including his former top aide’s use of a government office while technically on leave to run Cuomo’s reelection campaign. The charges against Percoco and his co-defendants -- Peter Galbraith Kelly, Joseph Gerardi and Steven Aiello -- stem from two separate bribery schemes tied together by the government’s key witness, former lobbyist Todd Howe, who pleaded guilty to facilitating payments totalling more than $300,000 from the executives to Percoco and his wife, Lisa Percoco. One of the schemes involved real estate developer COR Development and it’s executives Gerardi and Aiello. The second involved energy firm Competitive Power Ventures and Kelly, who is accused of giving Percoco’s wife a “low-show” job paying $90,000 annually. The defense largely based its case on attacking Howe’s credibility as a witness, claiming that he manipulated Percoco and the others into the schemes. Once he was caught for his own crimes, the defense attorneys claimed, he pointed fingers to try and reduce his prison sentence. That argument was bolstered in part when Howe was arrested during the trial for violating his cooperation agreement with the government. Prosecutors, however, have pointed to other evidence, including thousands of emails, that they say shows the corrupt agreements struck between the defendants. Howe’s testimony formed only a part of their case, they claim, and was far from the foundation of the prosecution. Echenberg also sought to counter the “friendship defense” forwarded by attorneys for both Percoco and Kelly, who claimed that the two did favors for each others because they were close friends. One example the defense cited was Percoco and Kelly going on a fishing trip together. “Even if there was a friendship between them...you don’t get a pass on bribery just because you’re bribing a friend,” she added. After Echenberg’s plea to the jury for a guilty verdict, Judge Caproni addressed the jury, reading through a 40-page booklet of all the charges against the defendants and instructing them to carefully consider their decision. Percoco and the three others, all corporate executives, face several bribery, bid-rigging and fraud charges related to state contracts sought by the companies represented by Percoco’s co-defendants. Percoco was charged with accepting bribes amounting to more than $300,000 from the three businessmen -- Joseph Gerardi, Steven Aiello and Peter Galbraith Kelly -- with whom he was involved in a broad criminal conspiracy, prosecutors have alleged. At a federal court in lower Manhattan, prosecutor David Zhou summarized more than six weeks of testimony in a final plea to jurors for a guilty verdict, reading a selection from thousands of emails that were presented as evidence in the trial. “‘Where the hell is the ziti?’” Zhou cited from an email sent by Percoco from his personal AOL account to lobbyist Todd Howe, a former lobbyist and Cuomo ally who played middleman in the conspiracy and is a cooperating government witness who pleaded guilty to several counts himself. The term “ziti” was thrown around hundreds of times between Howe and Percoco, old friends, and referred to bribes, as appropriated by the men from “The Sopranos,” the popular television show featuring the eponymous mafia family. “These are Joe Percoco’s own words...begging, requesting, demanding ‘ziti,’” Zhou told the jurors. Zhou meticulously laid out the prosecution’s case over the course of about three hours, detailing how Percoco allegedly wielded his powerful position in the governor’s office to take favorable official actions towards two firms, COR Development and Competitive Power Ventures, in corrupt exchanges with executives from the companies. Howe, in turn, funnelled payments from the firms to Percoco and to his wife, Lisa Percoco, who received a “low-show” job from CPV paying $90,000 a year for little work. “Ladies and gentlemen, you’ve put more time into this trial than Lisa Percoco did from her $90,000-a-year job,” Zhou said. The prosecution’s case was complicated when, earlier this month, Howe admitted to attempted credit card fraud on the witness stand, violating his cooperation agreement with the government and leading to his arrest as the trial progressed. As they began their closing arguments, lawyers for the defense emphasized Tuesday that Howe is an unreliable witness who is attempting to save himself from jail time. The prosecution tried to preempt that argument, with Zhou telling the jury he expected the defendants to attack Howe’s credibility. “They’re hoping to distract you from the clear evidence in this case. Don’t let them,” he said, emphasizing that Howe’s testimony was only a part of their case and that a massive paper trail implicated the defendants and did not depend on Howe. “You don’t need an insider’s view to convict these defendants.They convict themselves,” he said. After Zhou concluded, lawyers for Percoco’s co-defendants took their turns tearing into Howe while describing their clients as unwitting victims of a “master manipulator” who has even fooled the government. “The government’s case is heavily leveraged on Howe,” said Milton Williams, an attorney for Gerardi, a COR Development executive. Williams said Howe’s talent with the “magic phone call game” made him an effective operator who lobbied government officials and got things done with a simple phone call. Howe, he said, controlled “the flow of information” between all the defendants and that Gerardi was “played for a fool” like the others. “It’s up to you to stop the damage of Todd Howe,” Williams told the jury. “If ever a man exemplified reasonable doubt, it’s Todd Howe,” he said. 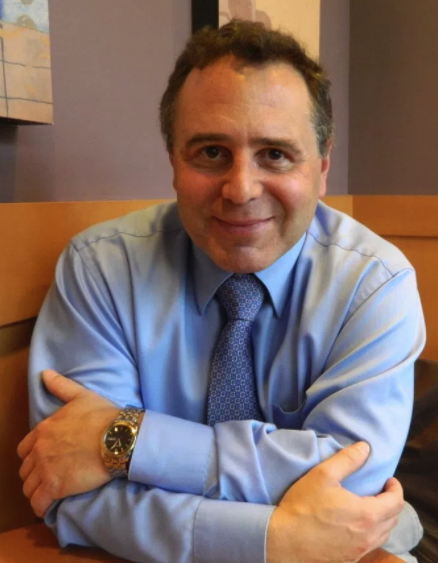 CVP executive Peter Galbraith Kelly’s lawyer, Daniel Gitner, also addressed the jury Tuesday, portraying the relationship between his client and Percoco as a close friendship. “Braith’s actions were never the actions of a man who thought he’d rigged the system,” Gitner said, using a nickname for Kelly. “Quid pro nada,” he added. Instead, Gitner said Kelly was simply a generous man who wanted to help a friend in financial distress with no expectation of any favors in return. “No such agreement was discussed. No such bargain was struck,” he said, explaining the circumstances of the how Kelly’s company gave a job to Percoco’s wife. Gitner also accused the prosecution of attempting to “whitewash” Howe’s contribution to its case in closing statements after “touting” him in the trail’s opening remarks. Just over an hour into his closing, Gitner was barely halfway done before the court adjourned for the day. Closing arguments will continue and may conclude on Wednesday, possibly leading to initial jury deliberations the following day. The trial has raised a number of questions about Governor Cuomo's knowledge of Percoco's behavior and ways in which Cuomo oversaw both his reelection campaign and government administration. Cuomo has declined to answer any media questions about the trial, saying it wouldn't be appropriate given the ongoing trial and his self-professed respect for the legal process.